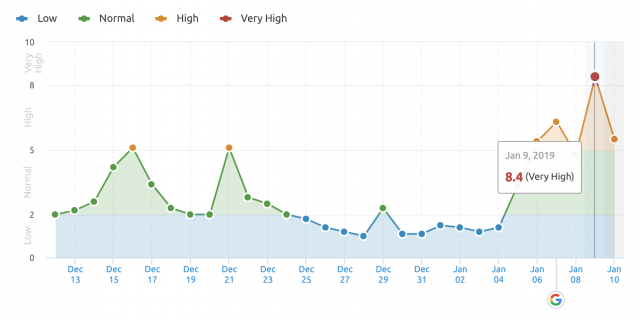 Google Search Algorithm Update On January 9th? | The SEO Dr. The Google search results and rankings have been pretty unstable the past week or so. There are a lot of fluctuations happening from earlier this week and also as of yesterday. Both the automated tracking tools and the SEO communities are taking notice. Earlier this week we reported about a Google search ranking algorithm update over the weekend. Now it seems to be continuing on and a big hit happened sometime yesterday, around January 9th. Just confirming that we are seeing some noticeable changes in the SERPs, especially today, Jan 9th. Yes! today the signals are quite intense. Probably going on for past 4 days No changes seen on the sites though. Yes, yesterday was busy for us also, plenty of visitors, and some converted! Here are some of the automated tracking tools that track Google fluctuations. I still did not get any official confirmation from Google on these updates – it has been a while since Google confirmed search algorithm updates.